Captain scoured the internet for a couple of years researching vessels, pondering which boats would be most suitable for a trip such as this. Size, efficiency, ease, comfort, practicality, price, quality, durability, what would suit our competency, needs and journey? We contemplated boats from afar; France, the Netherlands, England. Logistically and financially if we could find what we needed closer to home we’d be winning. We viewed eight boats in day, picked a top three, mulled it over, stepped onto Silver Paws again and knew she was the one. Of the three she was the smallest and oldest but the least expensive, agile, seemed to be loved and cared for and she felt right. Silver Paws is a Dufour 385 Sailing Yacht. Purchased new from France in 2005 by a Jersey-man she’s had a pleasant time racing and weekend tripping around Jersey, the Channel Islands and North France. We are her third Jersey owners and plan on stretching her legs somewhat further, starting with the Mediterranean Seas. 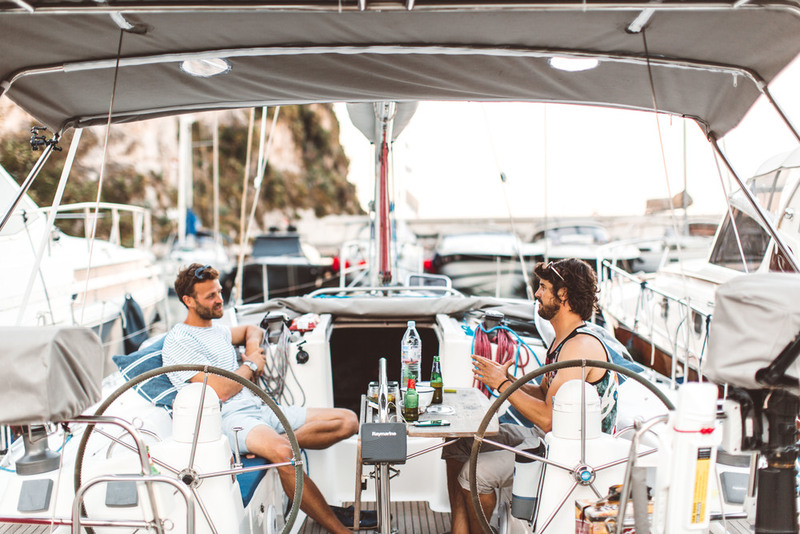 We’ve had to make some adjustments for this, living on a sailing boat requires a few alternatives to racing one, it's less about weight rationing and more about comfort. Starting by lengthening the bed. Captain is 6”4’, our first requirement when viewing boats to purchase was ‘Can Captain standup in the galley & saloon?’. We saw a few beautifully crafted yachts which would have been ideal but were instantly veto’d if Captain couldn’t straighten. If you’re going to live in it, the ability to stand up straight is a necessity. Secondly, could he fit in a bed? In Silver Paws case the answer was no, well not in the bow cabin which was where we wanted to nest. However, there was room for adjustments so she got the tick. Captain also designed a new arch for across the helm, for sun protection and solar energy panels to charge our batteries. To summarise, we also added a waste water holding tank, re-upholstered, acquired a new tender, and purchased every mans buddy; the BBQ. Sounds straightforward. However it took us a few months grafting to get ourselves and Silver Paws ready to set sail. Berths: 3 x Double berths, + double berth converted saloon. Sleeps 8.